The deep dark olive greens and rich blacks in this set provide for the perfect synergistic blend of colors in this Italian marble chess set. The chess pieces are classically styled. The entire set carries a stunning high gloss finish which gives off an ultra-deep appearance that will impress the most particular chess ethusiast. The board measures 16 x 16 inches. The King measures 3-1/2 inches. This Brazilian Marble set features beautiful coloring in crimson, black and jade. The playing surface has bronze and black squares, with a beautiful jade marble border. The traditional pieces have a classic motif with colors that compliment the board. The underside is felt lined. The board measures 16” x 16” with 1-3/4" squares. The King measures 3.5”. This set features black and white finely carved marble chessmen on a handsome black and white chessboard with black border frame design. The king measure 3.5” with a chessboard measures 16” x 16”. This unique European marble chess set possesses a clean appearance and gorgeous color combination. The white marble portions of the board and pieces carry subtle gray shades which add depth to their appearance. Rich black squares and the black chessmen provide for a fantastic contrast. The playing surface is surrounded by a jade marble border for a final touch. Click on the image to get a closer look! This wonderful chess set possesses a extraordinary combination of auburn reds and frosted white cream marble. Each individual chess piece in this set is hand carved so that no two sets are exactly alike. The chess board has has a felt lining underneath to protect your furniture from marring or scratching. The board measures 16 x 16 inches. The King measures 3-1/4 inches. The sand tones of the coral stone contrast beautifully against the ebony black marble within this set. The great thing about this piece is that no two sets are ever alike. The coral stone and marble characteristics are slightly different from set to set making each piece special. This hand-made set is ideal for collectors and chess enthusiasts that are looking for something unique, but still choose to stay with the traditional style that makes game play easy. This marble set makes a great display and conversational piece that will grace any decor. The board measures 16 x 16 inches. The King is 3-1/4 inches in height. This is a exquisite Italian Chess Set is crafted of coral and maroon marble. The marble Chess pieces carry the same matching shades of color from the board which adds to this set’s consistent flow and rich appearance. This is an extraordinary and distinctive set for any chess aficionado. The board measures 16 x 16 inches with 1 5/8” squares. The King measures 3 1/4” tall. 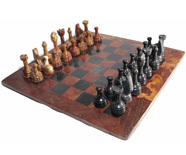 This timeless alabaster chess set includes a combination of deep blacks and translucent red-brown earth tones set on top of a black solid wood base. The soft flowing shades of the red and black in this set are downright breathtaking! The set measures: 16” x 16” x 1.5” with 1.5” squares. The king of this set is 3 1/4” with a 1.14” base. The sandy tones of the coral stone marble in this set play beautifully against its black hues. Each rustic chess piece in this set is meticulously hand sculpted for a totaly distinct and exclusive look. The perfect decorative functional set for the serious chess player and collector. The board measures 16 x 16 inches. The King is 3-1/4 inches in height. This solid marble chess set possess a Neo-Classical flair combined with a number of interesting characteristics. The beautiful Italian marble playing surface combines an elegant mixture of coral, taupe & deep sepia browns with hints of auburn red. The marble chess pieces match the board's colors. The chessboard measures 16” x 16” and the king measures 3 1/2” in height. This set includes a protective storage case. The Beccia Rosso and Ebony Italian Marble Chess set offers a unique and elegant appearance that will enhance the look of virtually any room. The stone’s unique shades of sandy tan, beige and black combined with its distinct veiny characteristic create a wonderful unmatched appearance. The marble board features a felt underlining to protect your furnishings from marring and also comes with a gorgeous storage case. The chess board measures 16” x 16” and the king is 3-1/2” in height. This beautiful set features natural black and white marble combination with a 3-1/2 inch king and a 16 inch chess board with 1.5 inch squares and a botiano border design. This great looking chess set is crafted of solid green and white marble. The set includes an 18” gorgeous chess board and 32 intricately made and hand polished white and green marble chessmen with a 4 ½” King. CS212-MF1BK. Black & White Alabaster Chess Set. This handmade alabaster chess set makes for the perfect gift for chess collectors or enthusiasts who appreciate something unique and exciting. Each alabaster set is hand carved, so no two sets are ever alike. This is an exquisite set perfect for display for your guests and family to admire. The king of this set measures 3” with a 1.13” Base. The board measures 14.5” x 14.5” x 0.5” with 1.5” squares. The Italian's infatuation with alabaster brings out the inherent beauty in this amazing chess set. A wonderful fusion of vibrant greens and whites create a dazzling appearance. The board measures 14.5" x 14.5" x 0.50" with a 3" king. This Alabaster chess set incorporates a soothing blend of tan-browns and black tones framed in a gorgeous solid black border. An entirely unique set that will grace any decor. Makes the perfect gift. The king measures 3" with a 1.13" Base. The chessboard measurements are: 14.5" x 14.5" x 1/2". This solid alabaster chess set possesses a unique flair combined with a number of interesting characteristics. The translucency and satin lustre of this fine alabaster set is comprised of an exquisite combination of black and tan-brown tones. Includes a striking set of coordinated chess pieces. The king measures 3" across a 14" playing surface. CS088-ST1BG. Vibrant Blue & Gray Alabaster Chess Game Set. This beautiful set is unique and absolutely gorgeous! The set is made from pure Alabaster with a beautiful combination of soft gray hues coupled with stunning turqoise blue. The set measures 14" with 1.5" squares and a 3" king. The neutral shades of black and white in this alabaster chess set make it the perfect item for any room decor. This fine chess set features a black and white tiered alabaster chessboard with 32 matching hand crafted chessmen. Black and white alabaster create a fantastic contrast that with the glossy and translucent attributes is sure to enhance the appearance of the set. The set measures 12.5 inches with 1.25 inch squares and a 3 inch king. 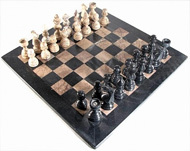 This beautiful set features natural black and brown alabaster combination with a 3 inch king and a 15 inch chess board with 1.5 inch squares, featuring a stunning wood frame with border inlay. Alabaster is relatively soft and has a luxurious look is also a natural material so all sets aren’t identical. This Italian alabaster chess set possesses a fusion of rich red and black alabaster stone set into a high lacquer wood frame with a handsome border inlay design ans chest storage. The chessmen are hand made and are hand polished to perfection. The board measures 13.5" with 13.5" squares and a 3" king. The set includes chess game pieces. This fabulous and elegant chess set features a black and white 15” wood framed chessboard with alabaster chess and checker pieces. This set is so unique and gorgeous, you will want to display it at home for all to admire!